Renting a self drive car is prevalent in western countries, but in India, it is on the verge of gaining the limelight status. With so many cabs and taxi options available in Bangalore, people are always inclined towards choosing a convenient choice of sitting in the back seat and enjoying the ride. However, let me ask you a question ..”are we really enjoying?” Though it sounds to be a convenient option, we all have undergone some moments, when driver invades our privacy or taking his top speed on a highway leaving us to tremble with fear. Just ask those who renting a self drive cars, they would have discovered the joys of their long drive and would have never considered cab as an option at all. Sounds interesting to you? Are you planning on renting a self drive car for this vacation? A great choice. let the excitement seamlessly flow to your road trip. Better clarity of things to look for while signing the agreements will allow you to take pleasure in the convenience of having a car rental, without paying unanticipated charges. Why not browse the internet and look for some reliable car rental company before finalizing one? Car rentals market is expanding with more and more adding to the list. However, if you look at the reliability, not all car rental companies are maintaining a high-level quality. Looking for reviews and ratings before booking one is essential. You can even enquire with your friends who often hire a car for their weekend gateway. Take a walk around the car and also peep inside for any damages. You do not want to take up the responsibility of the last person’s reckless driving. Isn’t it? It is just going to take a few minutes to check the car for the damages. If you find any, ask the car rentals company to make a note of it on their paperwork. Why not click few pictures in your smartphone to have evidence? It helps you when you are surrendering the car and if your rental company is charging for the damage. We positively didn’t deny on your familiarity about car models and how to drive them, but the things that you don’t know is, about the renting car’s mileage, oil levels, age of the vehicle, petrol or diesel vehicle, availability of road support, and more. Try asking questions about that particular car that you are going to rent and acquire all the required details. The car rentals companies deliver the car with a full tank fuel. However, while collecting the keys, ensure the fuel levels to verify whether it is on a full tank. Some companies offer, with or without fuel package whereas some covers the fuel cost in rental charges. Whatever be the package you are using, it is better to check by yourself the fuel levels to avoid any hiccups while returning the vehicle. Don’t go easy on this part. You need to study the fine prints of terms and conditions also analyze their tariffs then choose. Some companies renting a self drive car rentals by limiting the kilometers according to the number of days you are renting. Some might ask for security or caution deposit and some come with hidden charges. It all differs according to the car renting company that you choose, so look for kilometer limit, cancellation policy, fuel charges, caution deposit, types of payment accepted, process while returning and fees for the delay, you can even check for discounts and refunds. When you hire a car, they might ask you for a copy of the necessary documents such as Driving License, Aadhar card, and Passport. Some companies do facilitate the online uploading of scanned documents to their website or app. Ensure that while uploading through online, the documents are clear and readable. Be ready with the documents to avoid any last minute complication. With so many car rentals companies offering a large fleet of cars, choose the car rental company that gives you the maximum value and allows you to enjoy the trips with no strings attached. Remember, a cheap car rental is not always a safe rental and is not going to assure you reliability. A trusted provider who has built a strong reputation with a combination of these factors affordability, variety, feasibility, convenience, and security can leave you a worry-free car renting. 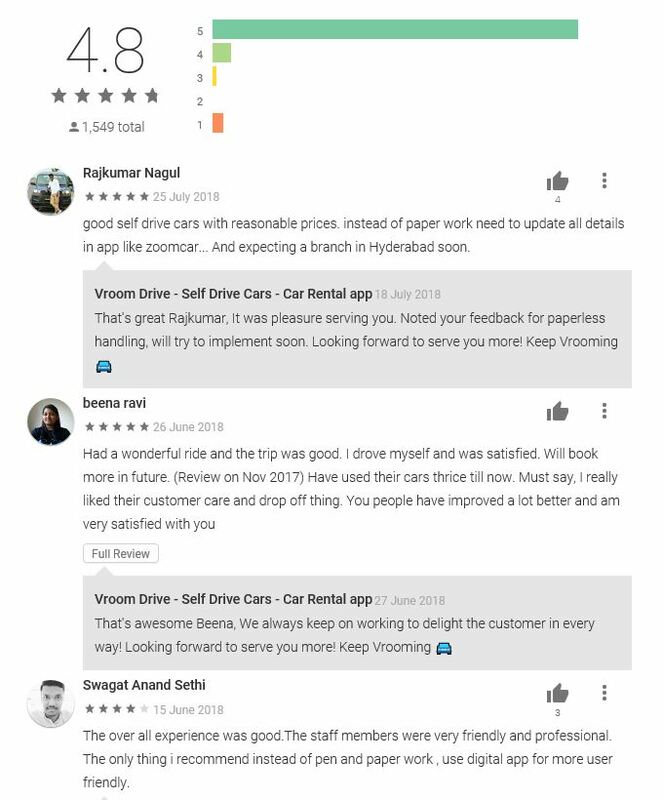 Now that you have acquired a clear understanding of things to check before renting a self drive car in Bangalore, it’s time to collect the keys and start “Vrooming”.